MCC won first 2003 league match by 8 wkts. Rain relented at the weekend to allow MCC’s first league match against Tegernsee to go ahead as scheduled. After winning the toss Lovell threw his wear-worn rulebook out the window and invited the visitors to bat first. This decision was looking decidedly dodgy at 60odd for two with young Moritz, German wunderkind going mental with two classic sixes off his legs. Hervorragend! Anyway Bunty Blades bowled his best swingers for some time to set the standard. Bostock and Steamengine Scott fronted well though, with Quietman Mcgree and Pramoder tidy too. Though far too many wides were bowled, with the legside wide rule being strictly applied. Solid glovesmanship by Chunderpaul Dean. After a nice cheese&pickle tea at the interval MCC hurried along to their target with the threat of rain somewhere in the back of the mind, losing just 2 wickets in a comfortable victory. Next league match is on Saturday 24th May v PAK ORIENT, current league champions. 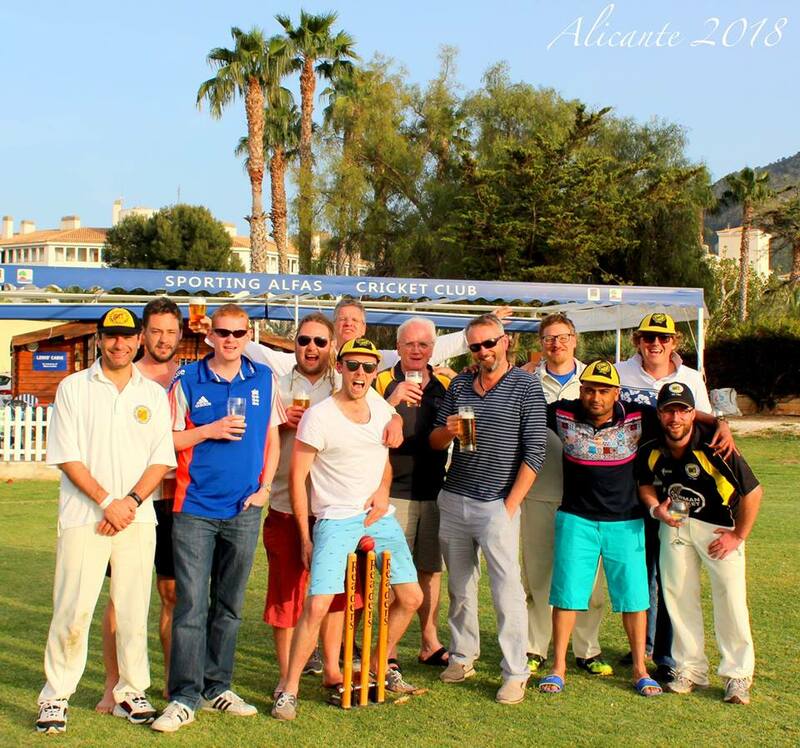 Next fixture v Tegernsee is the inaugural day/nighter in German cricket history on June 8. Bring it on Ritchie! Tony Blades-self-confessed cricket pig who ripped the guts out of the TCC innings with 3 quick wickets. Apparently hungry for more when brutally taken off! A bit harsh? MCC WON BY 93 RUNS AGAINST REIGNING LEAGUE CHAMPIONS. RECORD 205 1st WKT PARTNERSHIP BETWEEN VAN DADDAGE AND LOVELLI (LAPPED BY VAN D) SCHUMACHER V DAMON HILL? A beautiful steaming hot day (but not for running 2s,3s and quick singles)in the English Garden for the top two from last season when the visitors won the league on countback. Lovell won the toss or rather Waqar called incorrectly. MCC elected to bat- same rules apply. A somewhat sticky start against some useful bowling, fairly sedate progress on the slowish outfield. The visitors did not help their cause by putting both batsmen down at regular junctures. Cats and 9 lives and all that business but that’s cricket Richie. At the 20 over break MCC were 78 without loss with the tempo just about to be lifted. After drinks, Van Damage in particular took full toll after his escapes, while the skipper was happy to hold his Kiwi hand and sacrifice strike and regain some sort of breath in the 80 degree heat. Van Halen hit a total of 9 sixes in all and of course numerous boundaries. You just cannot afford to drop certain bats. By this time Lovell was close to delirium and fell to a good catch on the boundary for 60 off the only ball he middled all innings, but still a record opening partnership of 205 had come to fruition. Van Damage followed him shortly after for joint cold showers with 143 (record league score DES? )and ultimately MCC totalled 222-3 off their 40 overs. An imposing total, especially on the FLICX pitch. After curry sandwiches courtesy Pramod, the visitors set off in pursuit of their stiff ask of 223 to win. Power and Scott both bowled well at the start with Scott very mean almost Scottish not Geordie, just conceding 3 runs off the willow. As so often in recent times it was Quietman Mcgree and Bunty Blades who did most of the damage with 3 wickets apiece. 2 fine stumpings from young Dean behind the timbers. An important catch too by the Power on the fence to remove Waqar off Blades. In the end a comfortable victory by 93 runs. Next Saturday sees the MCC host the unbeaten Serendip in another league game. 1230 start. Spectators welcome. VAN DALSUM 143 – WITHOUT NECKSCARF. IMMENSE. Match Details MCC vs Serendip SC May 31 in English Garden. MCC won third successive league game by a convincing 9 wkts. A good toss to lose Richie. The visitors won the toss and chose to bat and why not? Who wouldnt? The brakes on a brisk start were applied by Bunty Blades and Bostock as SSC crawled to 38-4 at the interval. Impressive bowling aided by solid fielding and good catching. Spin twins Pramod and the Quietchipseater Mcgree further tightened the vice as SSC struggled to break the shackles. Ed Deanage had the batsmen glued to the crease with an impressive gauntlet performance. Farmer Gale came from nowhere to apply the finishing touches with 3 wickets in 8 balls as SSC subsided to 78 all out in the muggy conditions. Van Damage and the skipper Lovell strolled to the target with some controlled hitting, before Lovell was stumped. Amos Hebel vc & vd applied the finishing touches to a convincing victory. Well played I say. Next league game v CCB on June 21 in the English Garden. Pramod 2-9 off 8. Tight, hardly wasted a ball, beat the bat umpteen times with the batsman groping. Never stopped thinking. After winning the toss (endlich) and having a bat, MCC starting brilliantly with an opening stand of 150. With Lovo on his way to 50 and Van Damage on his way to the ton, both fell trying the 6 an over run rate even higher. The skipper charging 2/3 of the way down the wicket, attempting to hit the ball as it left the bowlers hand, was stumped for 40. Van Damage looking for the big one down the ground fell to a straight one losing his middle stump in the process. From then on, solid batting mixed in with regular wickets got the MCC to 248 from their 40 overs to set CCB a very tough (some might say impossible) chase. Needing a little over 6 an over from the outset. Then it came MCC’s turn to bowl with some accurate bowling from the openers, but not much luck with break through. Then came McGreesy into the limelight with devestating results demolishing the CCB innings and handing the win to MCC. McGreesy ending up with figures of 6 for 11 off 5.1 and finishing the CCB innings for 35 runs. This has put the MCC in very good stead to follow through and swoop the league. Well played guys, dominating effort!!! McGreesy is this weeks man of the match for his superb bowling effort followed very closely behind by the regular MOM Van Damage. MCC WON BY 1 RUN TO TAKE THE 2003 TITLE. In possibly one of the most exciting one-day cricketing climaxes since the tie between Australia and South Africa in the 1999 World Cup, the MCC somehow managed to defeat Lufthansa by a solitary run in a last ball thriller. 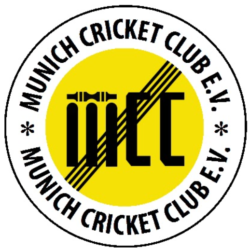 The victory by the MCC in the top of the table clash secures them the South German Cricket Championship, but it was Lufthansa that looked likely titleholders for most of the day – in fact right up to the final ball of the day if truth be told. The bookmakers gathered around the airport ground certainly thought so anyway. The game started with Lovell winning the toss for the MCC and electing to have first use of the teabag. However the MCC were missing the outstanding batting talents of van Dalsum on this day and had to contend with some tight Lufthansa bowling on a very slow pitch with tricky variable bounce. As a result, the MCC suffered an early order collapse to be 37-4 at the 12 over mark. The message to the rest of the team at this stage was simple – just bat out the remaining overs and get a decent score on the board. Due to some determined batting through the middle order, the MCC managed to achieve this objective and push the final score up to 144 all out, losing their last wicket off the very last ball of the innings. Highlights of the MCC batting was a solid partnership by Sembian (28) and Pramod (25) for the 5th wicket, and a strong innings by Dan Sear, who top-scored with 36 immensely valuable runs. Dan certainly made the most of his league debut after coming into the side at the last minute, with Blades withdrawing on the eve of the game with a hand injury. So the MCC were happy to finally reach 144 after a dodgy start, but the game was definitely in the balance. The key to the Lufthansa side was their gun bat Milan, get him out early and Lufthansa could allegedly fold like a pack of cards. Shop steward – one out all out? However the 2nd innings also got off to a bad start for the MCC. In his first and only over, an unfit Kiwi (suffering from a Gough type knee complaint) could only manage to get up to half (or possibly quarter) pace and was sent to graze/hide the remainder of the innings at deep fine leg. Lufthansa raced to 0-35 off the first 7 overs, with a large part of their score coming in wides, due to a fairly strict interpretation of the wide ruling by the umpires. Spin was introduced into the attack early to try and combat the quick start. This tactic managed to stem the scoring rate a bit after that point, with the pitch definitely supporting the spin of McGree, Pramod and Sembian. Lovell failed unfortunately when trying to talk VC Hebel into bowling his spinners too. By the final drinks interval, Lufthansa had proceeded to 57-2 off 20 overs – but Milan was still firmly entrenched on the teabag and Lufthansa had stackloads of wickets in hand. The resumption after drinks was a nightmare period for the MCC. Several gettable catches went down (mostly off Sembian) along with some other basic fielding errors, to allow Lufthansa to reach the 100 in the 27th over with still 8 wickets in hand. Things were looking pretty grim and the fat lady was seen warming up at Terminal 2. Finally though MCC were able to get the key wicket of Milan in the 29th over, clean bowled by McGree with the score on 106. There was even a hint of excitement/glee from the normally ultra-reserved bowler. The MCC were then able to turn the screws on Lufthansa at this point. With an improved fielding effort (including a couple of run outs, great work by Hebel and Dan the man) the runs started to dry up. Fast forward to the start of the 39th over, with Lufthansa now 138-7 needing only 6 runs to tie off the final 2 overs (a tie would have been enough for Lufthansa to win, due to a League rule that in the event of a tie, the side with the least amount of wickets lost is declared the winner). Andy Hebel managed to bowl a couple of tight dot balls, before the Lufthansa batsman managed to connect with a vicious pull shot thru mid-wicket with the ball finally finishing its roll some 15 metres beyond the mid-wicket fence. However on its way to the boundary, the magical red ball happened to slightly glance the roots of the only tree – and bounce over the massive water tank that is conveniently situated within the playing arena. According to local rules (agreed between the captains/umpires pre-game) if it does hit the tree/tank at any stage, it is an automatic 2 runs for the batting team and of course the ball then becomes dead. So the tree saved a valuable 2 runs for the MCC with a great bit of fielding at mid-wicket, at a really crucial time. Hebel bowled out the 2nd last over with dot balls. It came down to the last over with Sembian having been entrusted with the honour. Lufthansa requiring 4 runs to tie the scores and win the game and championship. Sembi bowled some great darts to concede only 2 runs off the first 5 balls – and they were just what MCC did NOT need OVERTHROWS!! Two runs were required off the last pill. The atmosphere was absolutely tense and electric as Sembi came in to bowl the last ball. The Lufthansa lefthander swung hard at the ball, but could only manage to jam the delivery to short mid-wicket to Lovell for a quick single who waddled up and removed the bails at both ends just in case to prevent the second run. It was game over red rover, as the MCC boys went into wild celebrations in the middle of the pitch, to win the match and the League title by 1 solitary run. Thank god for that bloody tree!! In an ideal world it would have to go to either Mcgree,Pramod,Sembi or Dan. It’s just too hard to choose really. The above were all outstanding performers on the day. Therefore in fairness it has to go to that tree. Great work. MCC 239-6 / 40 OVERS MICC 87-6 / 16.2 RAIN STOPPED PLAY. NO RESULT. GAME TO BE REPLAYED ALLEGEDLY. Another stinking hot Munich day with bugger all wind to speak of (to start with). MCC entered their final game of the campaign already crowned league champions after their reasonably close win against Lufthansa. Lovell won the toss and surprisingly elected to bat on the teabag. At 30-3 this might look a somewhat dodgy decision some would suggest. Sembi then blasted his way to a quickfire 47 with some savage strokeplay as MCC took the break at 20 overs at 82 – a good recovery. Pramod and Dan Sear then carried on the good work with a marvellous partnership. Marvellous. Pramod’s innings was chanceless and he finished undefeated on 72. Some lovely quick nimble footwork. Dan’s was less chanceless but he made the most of his luck/spilled chances with some great clean straight hitting before being bowled for 73. Harry carried on the good work with 21 as MCC closed on 239 leaving MICC a target of a run a ball to win. The forecast storms seemed a long way away at that stage. However 12th man and vulcanologist Nichols is an expert about these matters and during the teabreak the clouds became very very menacing indeeed Ritchie. The home side’s only intention was to overcome the 20over MCC score of 82 and thereby (according to league rules) win the game. Some good bowling by Scott and Blades, some suicidal batting and some great catches by Balaji, Power and Sembian left the home team’s innings in tatters at 87-6 when the heavens opened….No result,rain stopped play. Not really rain actually. Massive electrical storm stopped play would be more precise. Maybe we can do it all again before winter closes in. PRAMOD. GREAT INNINGS. NEVER LOOKED IN ANY TROUBLE. NEVER STOPPED THINKING. MCC REACH CUP S/F WITH 7 WKT VICTORY. Weather : warmish. Conditions : ambient. Toss : lost(!!). Breeze: None. Teas: Müller gut/Balaji. Crowd: sparse. Opposition: Soundly beaten. Bowling: Scott : tremendous bowling. Batsmen all over the shop. Ohne wides would have been nothing short of a sensational spell. Deserved more than just the one wicket. Blades : nagging. Chances galore. A well deserved two wickets. McGree : economical as per, if a little sedate – obviously saving energies for what was to come. Hebel : kranky as. Couple of nice sticks. Bonza. Balaji : 3.5 an over – that’ll do nicely. Bowling, bowling. Pramod : tight – kept the pressure on. Couple of important wickets.Lovely jubbly. Fielding: Appavu : the words escape me. What a catch, my son. Van Dalsum : ditto. Balaji : safest hands in the club. Hoping to shine one last time for MCC before departing for home, aren’t you Balaji? Hazza: Dropped a difficult catch but turned it into a great piece of fielding for a great run out. Wicket keeping: Herr Liebel : satisfactory. Batting: Van Dalsum : biiiiiig. Foundation layer and destroyer of bowlers and hopes. Did enough damage to force opposition into taking desperate measures – hit on ankle by wayward throw – retired hurt. Hebel : kranky. Full toss. Out. Hmmm. Kranked up krankiness. Sembian : probably scored his 9 off one ball dispatched into nearest river, can’t remember though – was sleeping. Apologies. Pramod : the Chris Tavaré of Munich. A ship steadier unconcerned with averages, however. Balaji : Not out – saw us home. Sear : boring. An allround performance worthy of a semi final place. Great show in the field by all and with Van Dalsum in great form after his 2 week holiday in Croatia. S/F V POCC/TCC coming soon to a cricket cinema near you. Scott/VD share it with big performances. MCC lost by quite a few. Pocc won the toss and batted first as is their want in this cup semi. At the interval (20ov)the game was quite evenly poised with POCC 5 down approaching the 100 mark. This included a great running catch by VD and an equally fine run out by Dan Sear. Waqar blasted 68 in fine style but even then 230 was felt to be par for the course with the quick outfield and good batting conditions. Blades the pick of the MCC bowling with 3-33. Too many wides were bowled in general with 39 extras in Pocc’s total. In reply Mcc lost both openers caught behind driving early doors and were never to recover.. Hebel went played on and a couple of bad run outs ensued. A p1ss poor batting effort all round really. All credit to our victors though who played well and deserved their convincing win. Shabash to them. Thanks to Mrs VD for the lovely tea as well. Next.